April is Financial Literacy Month. Some may even know it colloquially as FinLit month. This month presents a chance for those who feel that they need to bone up on their financial knowledge, to get exposed to an uptick of financial education, and it is also a chance for those in the financial industry to step up and offer additional value to the communities we serve. At InvestEd, we take the duty of providing financial literacy seriously; it’s a major staple of what we do. We understand the importance of equipping people with the right set of tools, i.e. a solid financial knowledge base, in order to navigate their lives in such a way that money promotes access to opportunity, rather than be an enabler for financial missteps. This month, we truly hope to drive home the importance of financial literacy and how it should be a part of every single person’s life. If the promise of financial stability isn’t reason enough to expand your financial literacy, allow us to share some reason here. Let’s dive in! 1. It sets you up for better finances: Think of a person you know who you feel has it on the ball when it comes to their finances. Chances are, you've heard them talk about their finances, what books they've read, people they follow or conversations they had with their advisors. These are people who are constantly filling their knowledge bank with more information that they can use to make their daily life easier. A person who is financially literate is equipped to manage their money wisely. When you're able to manage your money wisely, great things happen. For one, you begin to save with a purpose in mind. You may also start to think beyond the now and develop the best course of action to get you to where you want to be financially in the long run. Furthermore, when you become more financially literate, you become aware that it's best not to travel that road alone, so you decide to get an advisor. With a fiduciary advisor, you’re sure to have objective conversations geared towards maximizing your current assets to help your reach your goals. One last point to be made here is that financial literacy can take anyone’s financial game up a notch or two. If you were born into money, live from pay check to pay check, or fall somewhere in between, understand that increasing your financial knowledge is key to unlocking your full financial potential. No matter your income earnings, being financially literate can help you understand and maximize what you currently have so that you can live the life you want. 2. It helps the economy. As a citizen in any community, being financially literate has huge effects on your economy. In the big picture of things, having more people who classify themselves as financially literate increases wealth equality in communities. 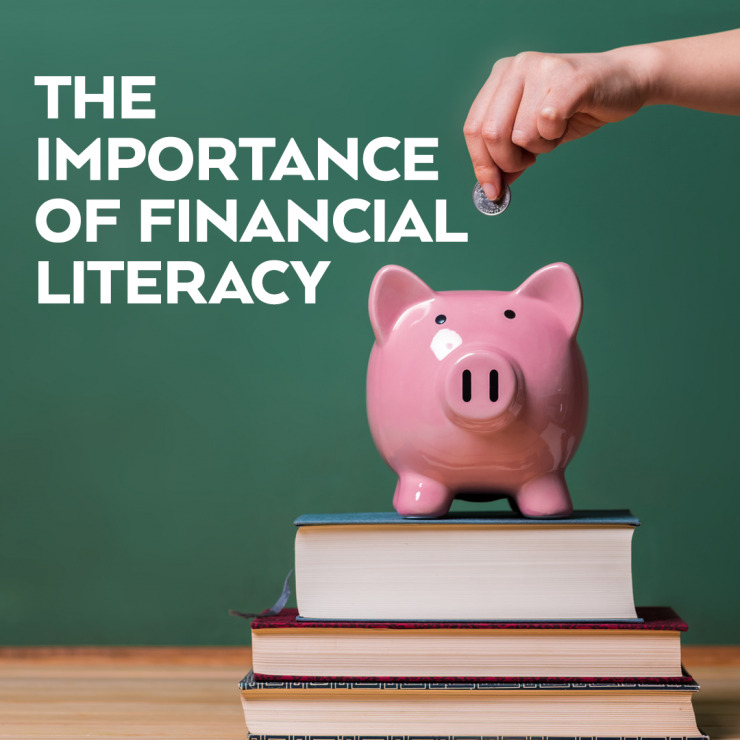 According to researchers at the Wharton School at the University of Pennsylvania, "one-third of financial equality in the US can be accounted for by the difference in financial literacy." Increasing financial literacy has a direct correlation to making better money choices and thus increases an individual's personal wealth. You multiply this behavior by hundreds of more people in a community, and you end up with more thriving financial individuals, thus decreasing financial inequality. Another point in support of how financial literacy helps the economy is that it decreases personal debt. Financial illiteracy leads to poor money management and costly mistakes. A lot of people have racked up credit card debt while young because they didn't fully grasp what credit is, how it’s designed and how it should be handled. Because of this, we have a huge population of people who are still deep in debt, with no true guidance for getting out, and they don't have as much liberty to contribute to the economy other than through purchasing their necessities and decreasing debt. When you make financial literacy a priority, you can support yourself with getting out of debt or be strategic in how much you take on as an adult due to life changes. When you can do either of these things, you'll be in a position to spend money at your discretion and be a contributor to economic growth. 3. It supports generational wealth: This is a big one. The phrase “each one, teach one” comes to mind. It may not be at the top of everyone's list to want to bear the weight of setting the stage for generations to come, but it's a responsibility that we should all give thought to. This especially should be considered if you have already started a family. When you make receiving financial education a priority in your life, it's arguably your duty to pass the same financial principals on to your family. Families that pass down an inheritance, but not the financial literacy tend to see their families wealth gone by the time it hits its second generation. If you want the work you do today to compound for generations to come, financial education has to be a part of your conversations. As it's been mentioned throughout this blog, financially literate people make financially responsible decisions that allow them to thrive. If this is the type of life you want, we're sure your family’s offspring want the same tools to help them avoid the pitfalls that so many others have fallen into because of not having the appropriate financial education early on. 4. It supports you in your pursuit of happiness: Money stress is a whole different feel from all other types of stress. It can feel suffocating; it prevents you from living your best life and probably keeps you in bad mood. A study done by the American Psychological Association showed that 72% of Americans are stressed about money, probably because they don't have enough money to cover an emergency and have expenses that prevent them from spending at their leisure. The antidote? Financial education. Yes, your level of financial education is the root of your financial stability and that financial stability informs how you make decisions about how you spend, save and invest your money. When you feel financially stable, your mood changes and you can breathe a sigh of relief that things are on track. When you're on track, you can then lend your attention to those small things and treats that you may have deprived yourself of in order to get by or as part of a plan to save. Those small treats or big rewards are what we call balance because it brings you happiness while still allowing you to work your financial plan; a plan that all stemmed from you taking the time to increase your financial literacy. In closing, we hope that this blog has encouraged you to take financial literacy as seriously as we do. We know that it is being highlighted this month, but we implore you to remain a lifetime learner and stay current with information that will support your financial goals. If you don't know where to start your search with financial education, there are plenty of resources online and we'd be remised if we didn't say that we'd love to share our knowledge with you at any of our in-house seminars and online webinars. If you'd appreciate a more personal touch, complimentary financial planning meetings are always available. Consider this your own personal workshop time to talk to a fiduciary advisor about all your financial concerns and goals, and walk out empowered with a plan. Remember, your best interest is always our top priority and by supporting people becoming financially literate, we believe we're doing just that. Call or email us any time. We'd love to help. Happy Financial Literacy Month!